The dreamy fragrance of Hermes “Brin de Réglisse” is a distinctive spicy lavender that once you smell it, the scent becomes burnished in your memory, and much the same phenomena hits you after a sejour at the magical provençal Le Clos Saint Saourde. Note: Réglisse means licorice, and the adjective is often attached to descriptions of spicy Rhone blends, such as the “Cerise et Réglisse” vintage produced by the Clos des Patris in nearby Caromb. Unforgettable at Le Clos Saint Saourde are its dry stone walls whose impassive earthy tones warm the two suites and two rooms of an L-shaped 18th century farmhouse (a mas), lying under the gaze of the jagging silhouette of the Dentelles de Montmirail, hugged on all sides by vines of the appellation Beaumes-de-Venise. 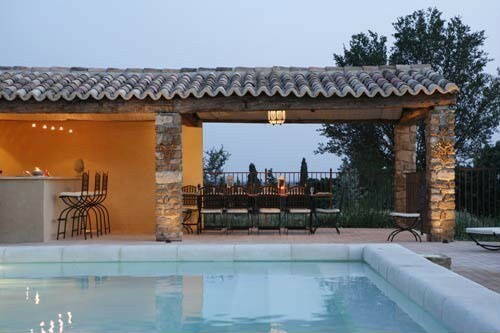 Saourde is Provencal for the natural spring at Le Clos. The images of the accommodations: imperishable. 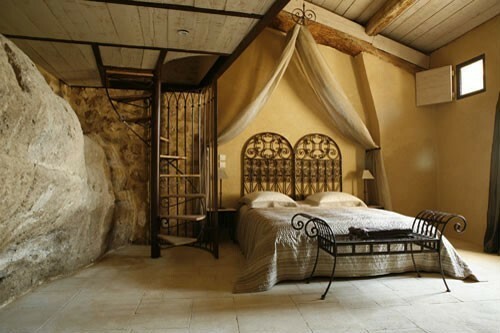 There are two elegant suites which occupy a former hayloft: The Suite Castillon has a ground floor living room with a stone staircase leading to the bedroom (pictured above). From the courtyard, a stone staircase leads to the Suite Roche d’Espail (pictured below) with adjoining living room. 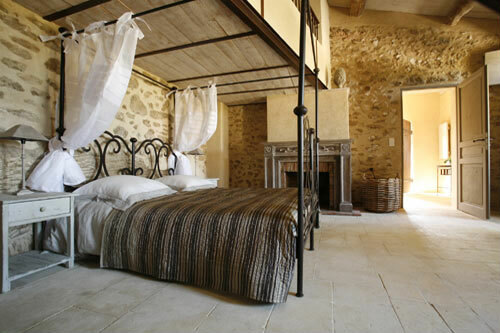 Both suites have fireplaces and sweeping views of the vineyards and countryside. The divinely-appointed two rooms are spacious, with couches and tables. All suites and rooms have queen size beds, WiFi, and include continental breakfast. The two suites and one of the rooms have both bath and shower. 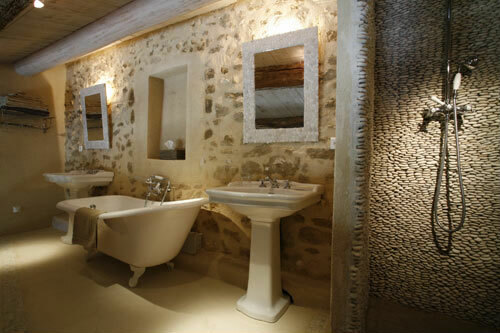 The décor of the bathrooms is immaculate: stones, Italian showers and wrought iron lamps. A mild irony comes calling when you find yourself within Le Clos Saint Saourde: there is so much to explore and experience in the Vaucluse, yet the comfort and luxury of Le Clos is so reassuring and felicitous that your impulse is to hang at the pool with a verre de Muscat, gaze fondly at the scenery, and let your mind wander. La vie oisive…Ça va sans dire. 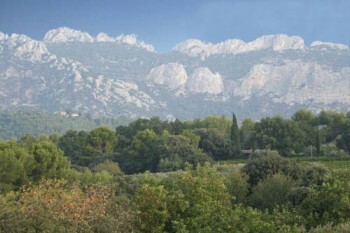 This entry was posted in Reportage and tagged B&B, Beaumes-de-Venise, Gites, Hotel. Bookmark the permalink.